ZEBRAS-WILDEBEEST-IMPALA-BLESBOK-OTHER ANTELOPE- BIRDLIFE- 3 BASS DAMS-RUNNING TRAILS-BRAAI AREAS AND POOL-BOMA BAR & RESTAURANT- FREE KIDS ZIPLINE-BIKE PUMP TRACK AND PLAY AREAS-AND MUCH MORE…..
St Ives Lodge and Venue is situated in the heart of the Lions River Valley in the KZN Midlands. St Ives is a Family run establishment and a lot of love is put into all that we do! This 140-hectare Family Owned & Managed Estate offers something for everyone. 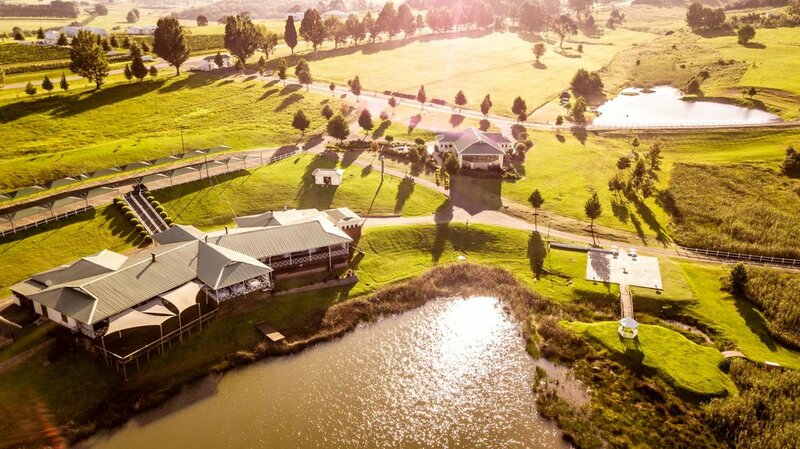 The Lodge sleeps 48 guests with Wild Animals Roaming the Grounds & the Picturesque Dams, A Unique and Elegant Wedding Venue set on raised decks overlooking the Lake, with an In house event Planning Team to assist in making your Every dream a Reality, As well as Conference and Functions Facilities. Not to mention the Delicious Food, A BOMA Bar( equipped with a Kids play area), This amazing Culmination is a Recipe for Great Success and a Place where our Guests can retreat to and call Home. Be sure to visit Soon! Prior to the 1800's the Midlands of Natal was used by the Zulu royal as a hunting reserve which was abundant with elephant and lion. The last lion to be killed in the whole district was shot in a deep gulley on St Ives Hill, and the shooting of this lion resulted in the area, looking down onto the river below, to be called “Lions River”. The name St Ives originates from the birthplace of John Day, who was born at St Ives, Huntingdonshire in England and purchased the farm from the Boer Settlers in 1862. The first Durban to Johannesburg railway line ran directly through St Ives and reached Johannesburg in 1893. St Ives was established as a horse stud in the early 1900's and was a renowned nursery for top thoroughbreds including the horse “Legacy” winner of the July handicap in 1933. ridden by Ernest "Tinker" Lariviere, the betting stood at 13 to 2 and won William Raw, the owner of St Ives at the time 5000 pounds.